Lithgow City Council has begun the concept design process for the planning and creation of the Cullen Bullen Sewerage Scheme. The concept design process is undertaken to provide a preliminary layout for infrastructure and ensure the scheme will have as little impact to residents and properties whilst being able to serve the desired purpose. Whilst a location for the sewerage treatment plant has not been finalized as yet, the preliminary reticulation layout has been created for the township. Some properties within the township have been identified as requiring reticulation to be constructed through private property, however this will be done with as little impact to the property and residents as possible during the construction phase. 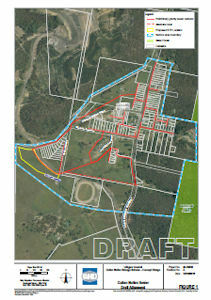 Available for download on this web page are the draft concept design documents for reticulation of the township which will be discussed at an upcoming meeting with Lithgow City Council and residents of Cullen Bullen on 15th January 2019 at the Cullen Bullen Progress Association Hall commencing at 5pm. If you require any further information, please do not hesitate to contact Council on (02) 6354 9999.